Spectacular results with minimum effort. 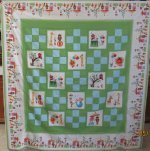 Make this adorable quilt or use the animals on a store bought blanket or bib to personalize. 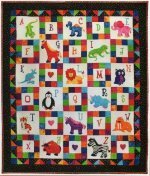 Little ones LOVE this brightly colored children's quilt. The 54 page book includes complete appliqué instructions with Debra’s famous NO REVERSING, NO TRACING raw edge method. There are 26 easy to make appliqué animals and a full gallery of ideas. The pattern included goes together quick and easy with Debra's applique method and blocks made with strip piecing. This is a great beginner project! Your kit comes complete with all the fabrics needed to complete the 44" x 52" top, the book, and all the fusible needed for the applique. Once again, we've nearly sold out of these wonderful boxes of batiks. We have a handful of Black+Bright collections left. We've requested more from the manufacturer, but they're on back-order for now. They're back in stock! The beautiful Bali Designer Boxes from Batik Textiles are back in stock and we have a great selection from which you can choose: Black, Blues, Blue/Multi, Earth Tones and Purples. Get them while you can - they sold out in record time the last time they were available! We've pulled together a beautiful collection of batiks to go with this pattern from Morning Glory Designs. We've emulated the colors shown here in our latest batiks. Beautiful design + easy instructions = one gorgeous quilt! Bonus: you get free shipping (U.S. customers) on your entire order when you purchase this kit! We just love this pattern from Bean Counter Quilts! "Quick Delivery" is just that ~~ quick to cut, easy to piece, and even quick to quilt with an allover pattern ... you can have a baby quilt or the larger lap size quilt (shown here) done lickety-split! Our kit includes a variety of beautiful batiks in brown and blue, and would make a terrific gift for that guy in your life. Our batiks give it a modern feel! This kit includes all the fabrics for the top, binding and the pattern, shown here. This fun wall hanging is perfect for that "cave man" in your life; you know, that one that has to have his "man cave" for all things manly. And you won't believe how quickly this adorable wall hanging goes together! Diane's instructions are SO easy to follow, the applique pieces are big (adding to the ease), and when you stitch down the edges of your fused applique pieces after the batting & backing have been added, you're quilting this jewel at the same time. Our Labyrinth Quilt Kit contains an exquisite collection of batiks, and is available in a lap size kit, or queen size kit. Instead of using browns, as designer Debbie Maddy did, we chose to go with a luscious collection of [mostly] purples. Each kit comes complete with the pattern and fabric for the top and binding. As with all of our kits, each fabric is marked as to where it belongs on the pattern, taking the guesswork out of it for you. Shipping is included free of charge (U.S. customers) with your purchase of the queen size version of this kit! Josephine's Knot is a stunning new pattern from Debbie Maddy - one that looks complicated but is made easy with her wonderful directions. We've replicated the fabrics used in her sample to some degree, replacing the light green center square, as well as the dark brown background squares, with gorgeous purples. The kit includes the pattern and fabric for the top and binding. As with all our kits each fabric is marked with its corresponding position on the quilt top, so the guesswork has been removed for you. All you have to do is cut and sew! We've had requests for this kit, and here it is! With this kit you'll receive over two yards of beautiful batik fabric plus the pattern. One half-yard cut is included for your binding; the rest is pre-cut into 6" charm squares from 28 different batiks, so you'll wind up with a very scrappy, completely unique table runner or wall hanging when you're done -- ready to use or give as a gift. Here's a quick 'n easy idea for a quilt! Make our Island Express lap quilt using just one charm pack, plus 1/4 yard for 2" inner border, and 1 yard for a 6" outer border and the binding. Using our pre-cut 5" charms, you can put this top together in about 2 hours, including the time it takes you to decide how to lay out your charms! We used Hot Magenta for our inner border, and Island for our outer border & binding for this sample. Looking for maximum impact with minimal effort? Ready to conquer your fear of sewing curves? Try our pre-cut Fall Festival Kit! It comes complete with batik apple-core shapes that are precision cut with notches & arrows to make matching intersections seriously easy.